The boiled and peeled eggs were mainly sold to cafeterias, cafes and catering firms, the Danish Veterinary and Food Administration said in a statement. Denmark is the latest European country to discover eggs contaminated with fipronil in its food chain. Two managers at a Dutch company have been arrested during joint raids by Dutch and Belgian authorities. The company - named as Chickfriend by local media - allegedly used fipronil at poultry farms, prosecutors in the Netherlands said. The eggs have come mainly from the Netherlands with some originating in Belgium and Germany. The insecticide can damage people's kidneys, liver and thyroid glands if eaten in large quantities. However, the Danish food administration urged calm, saying the eggs bought by Danæg Products posed no risk to human consumption. "Samples analysed in the Netherlands show traces of fipronil in the eggs, but not as a health hazard," the agency said [in Danish]. "Because the content is illegal, Danæg Products must withdraw the eggs from their customers." Twenty tonnes is the equivalent weight of two-and-a-half African elephants. Denmark is believed to be the tenth country affected by the widening scandal, with Romania and Luxembourg among the latest to report finding contaminated products. Romanian authorities said on Thursday that one tonne of liquid egg yolk contaminated with fipronil had been found in a warehouse in the west of the country. The product was imported from Germany but had not been sold to consumers, food safety officials said. Fipronil is banned from use in the food industry under EU rules. In a statement, the prosecutors said investigators were also focused on a Belgian supplier, and another Dutch company "that colluded with the Belgian supplier". They added: "They are suspected of putting public health in danger by supplying and using fipronil in pens containing egg-laying chickens." Chickfriend, a poultry farm cleaning company, is yet to comment. Investigators in Belgium have also carried out several raids and identified 26 people or companies as suspects, AFP news agency reports. Some 6,000 litres of "prohibited products" were seized in Belgium. But it said it was very unlikely that there was a risk to public health. However, 11 products containing egg - including sandwiches and salads - have been withdrawn from supermarkets. The Netherlands is Europe's biggest egg producer - and one of the largest exporters of eggs and egg products in the world. 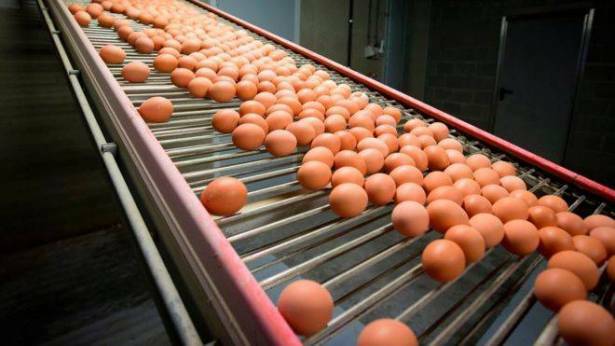 Some 180 farms - which produce millions of eggs a week - have been temporarily shut down while further tests are carried out. It is thought that fipronil was added to an allowable treatment for red mites. It has since emerged Belgian officials knew about the contamination in June, but did not make the information public because of a fraud investigation. But Belgium has in turn accused the Dutch of knowing about the problem as far back as November 2016, which they deny.